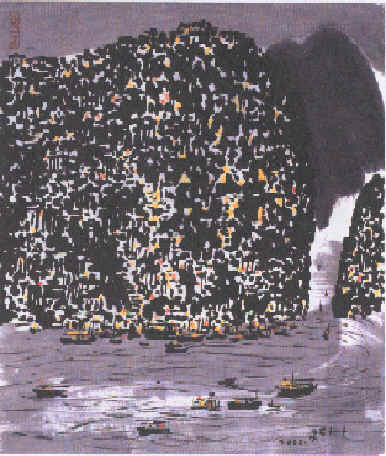 ' At nights, the ships on the Yangtse River sail into the dark gorges, giving people a severe situation. Sometimes, there is moon in the dark sky with stars twinkling, which also gives people the sense of fear. There are many cities, layers after layers, along the two sides of the Yangtse River, presenting us a spectacular scene. During nights, there are lots of lights in the cities, which look extremely splendid and magnificent. Whenever we sail through the mountainous cities, I always enjoy the night scene very much. But I can not find a way to present this spectacular scene in the way of painting.
' People usually make scaffoldings before they construct high buildings. High buildings can be constructed on scaffoldings. When the buildings are completed, the scaffoldings will be moved away and be forgotten forever. It is not easy to make the high scaffoldings as they should be made as high as the buildings. They crisscross with each other and are exposed to people. People can easily see the construction workers are constructing magnificent buildings.
' Some people like peach flowers and some like peaches themselves, because they are popular. Peach flowers are colourful, popular and beautiful. 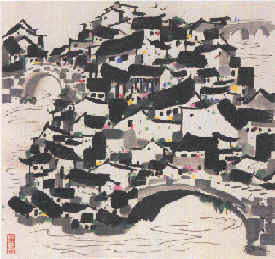 They take their roots among the village girls and old village womanand they ate often made the theme of some Chinese classical poetry, such as "The Story of Peaches-flower Garden". 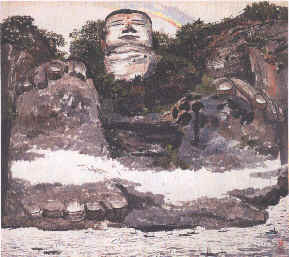 The painter also pays great attention to the land and history of the people. 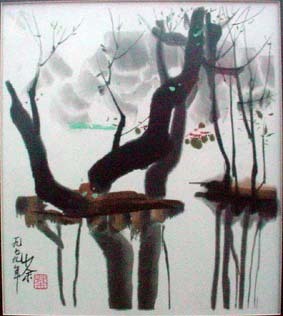 When he said that peach trees would blossom again the next year after they fell off, Zhu Ziqing only made the use of artistic wrong impression. In reality, it is not the truth, because this year's peach flowers and peaches are not the ones of next year. People use peaches to imply longevity because they suppose it would take 3 thousand years for the peach trees to bear fruits. When I worked out this painting , I painted the grey moving lines as clouds to fill in the empty place of the painting. 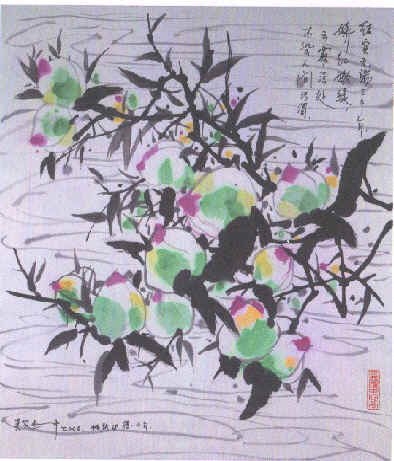 I also wrote the following words on the painting: It would be no need to take 3 thousand years for the peach trees to bear fruits and the red peaches and green leaves up in the clouds would not be polluted as they are in the world of human beings. I have also added another sentence which says it would have to take one thousand years for the peach trees to bear fruits in celebration of the new century.
' It is difficult to find a very quiet place even in the deep mountains. As the saying goes the tree may prefer calm but the wind will not subside, which means there is no easy life and the struggles taking place among people. Too Yuanming could not hear the noises from the streets even he lived in the busiest downtown area, which was really not easy. 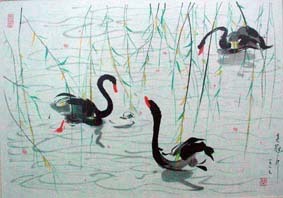 I visited a birds' paradise in Xinhui County, Guangdong province. But as soon as I entered it, the birds flew away immediately and the paradise disappeared. 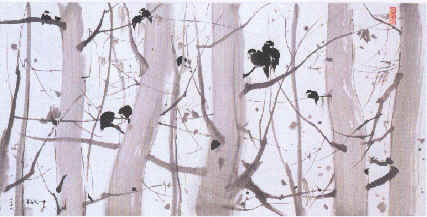 After I returned from the forests, I made a huge painting about the forests with birds in it, entitled "The Birds Paradise". 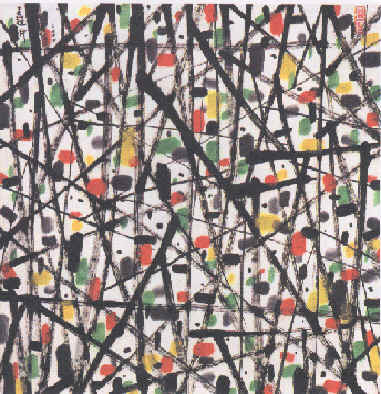 In the painting, I pursued the sense of mistry from the diversity.